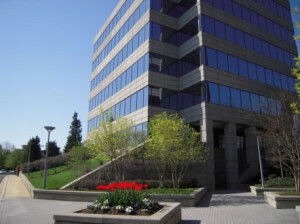 Our Virtual Office Washington is situated just north of Washington, Virginia in the area of Rockville, Maryland. Right of the Interstate Road I 270, only 20 minutes away from Down Town Washington. Dulles International Airport and Reagan International Airport are both only 30 minutes driving time from this convenient location, making it easy to reach from several directions. The full floor of executive office suites are turnkey operations, meaning fully furnished and serviced, ready for you to move in and have your business up and running in less than 24 hours. The shared receptionist and administrative personal are there to represent you in your companies name, making it easy for you to manage your business even if you are not occupying an executive office on a permanent base, but only utilize one of our Virtual Office Washington plans. You can easily get your business started at our location, right from the convenience of your home. Just add the location to your cart and follow the checkout process, you will have the opportunity to chose from additional services, like phone answering or virtual assistant services, you can also add these services at a later time if you so desire. To get more details about the location or to visit us, please call 1.866.793.7969 or send us an email by clicking on the inquiry button below the description. We will gladly arrange a tour of the facilities for you.